Service at Langner Eye Care extends well beyond the exam room into our comfortable dispensary. 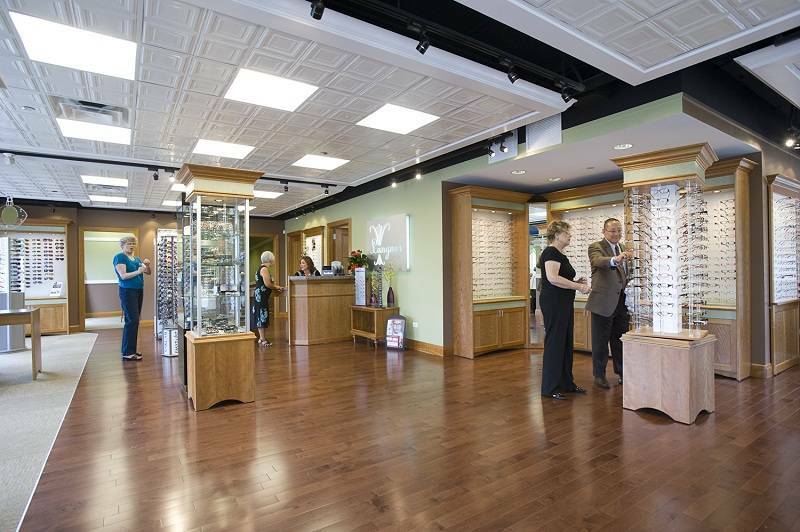 The dispensary has been designed to allow you to choose frames in a comfortable setting. If you prefer, our staff will assist you in finding the right frame for you. Not clear on the advantages of lens enhancements such as anti-reflective coating or polarized lenses? Our experiences staff can help you understand how these will help your glasses perform better. Langner Eye Care features a full selection of frames, contacts and sunglasses to fit your personal style and budget. Frame lines have been carefully selected to offer a variety of styles and price points. You won’t find expensive boutique prices at Langner Eye Care–we are proud to offer over 600 top quality frames at reasonable prices, backed by professional, courteous service. Why deal with inflated prices just so a chain can offer you a “discount”, or special pricing available on only a few frames? Langner Eye Care has nearly 100 fashion frames for only $90.00–every day. These are new frames, not overstock or discontinued frames you will find on special at many optometric chains. If you are looking for top designer frames, visit our office to try on the latest styles from designers like Gargoyles, Reebok Kliik, Duetz, Scott Harris, Cote D’Azur, and Michael Ryen. Click on the links below for more information on some of our designer lines. We can help you see your best during your next ride or shoot.